This year marks the 20th anniversary of the Benton House’s restoration. This is the beginning of the journey. 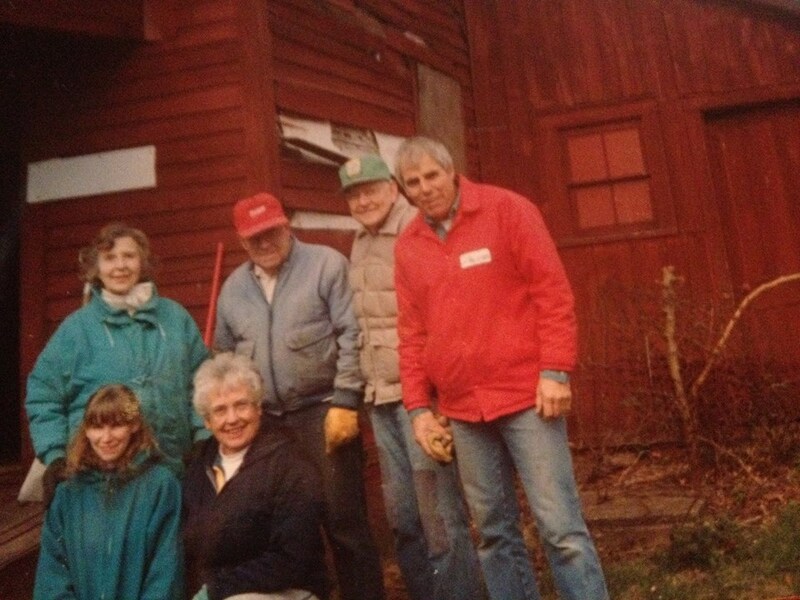 Pictured below are the homestead at it’s previous location on the Hubert James’ Farm and some of the folks that made the magic happen ( Eve Johnson, Lyn Howard, David Perry, Jr. Withey, Karen Flamand, and Sue Jacobson). Photo courtesy of the Kaneville Township Historical Society. The Kaneville Township Historical Society is celebrating the 20th anniversary of the Benton House move from the James Farm on Harner Road to its present location on Lovell Street in Kaneville with an open house from 8 a.m. to noon Sunday, June 8. The move and subsequent restoration of the historic home was made possible through the efforts of many volunteers, including but not by any means limited to the folks pictured in the attached photograph (Eve Johnson, Lyn Howard, David Perry, Jr. Withey, Karen Flamand, and Sue Jacobson), courtesy of the Kaneville Township Historical Society. Visit the Historical Society’s Facebook page for more. The Historical Society hosts an open house each year, but this year’s 20th anniversary celebration promises to be special. Both the Benton House and Farley House will be open to the public. Kaneville artifacts, photos and history will be on display, and the Long family history will be shared and celebrated in the Farley House. The Benton House and James House are located on Lovell Street, across from the fire barn at 46W536 Lovell St., Kaneville, IL 60144. For more information, contact the Kaneville Township Historical Society at kanevillehistoricalsociety@gmail.com. ← KC CONTEST: Who Can Come Up With Best Idea for a Kane County ‘Token of Esteem’?